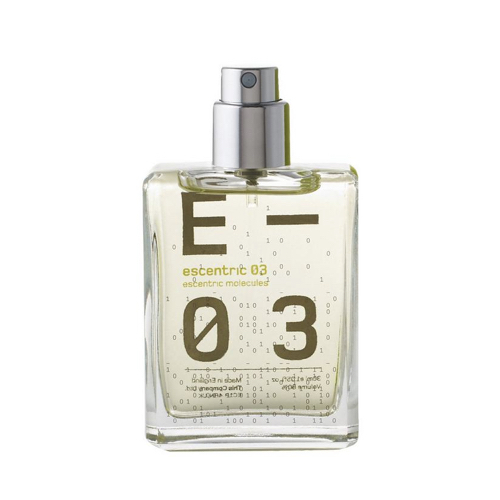 Escentric 03 is a tribute to the more familiar side of vetiver: its dark, slightly exotic woodiness. The fragrance opens with a burst of freshness – the ginger root is joined by top notes of green peppercorn and Mexican lime. The heart of orris is surrounded by Egyptian jasmine and soft tea notes. Then, at the base of the fragrance, the slightly bitter notes of vetiver are smoothed by rich amber shades of sandalwood, cedar, leather and musk. The overall impression is spicy but fresh with warm balsamic undertones, like a traditional chypre. It’s sensuous without sweetness, which is a signature by perfumer Geza Schoen. And, because he also excels at unexpected associations, you may even detect a fugitive tang of ginger ale.